Hello guys! Winter is here (at least it seems like it today), snow snow and more snow ! It actually makes me happy since it’s starting to feel that Christmas is coming soon and it was also the perfect opportunity to help my boyfriend set up the Christmas lights outside, and of course it was also a great opportunity to wear one of my favourite sweaters too! Look at the sleeves... For some people it may seem weird, but I’m just in love with the tie sleeves! I think it makes the sweater look way cooler and it’s super original. I also have to mention that it’s super comfortable as well, so definitely I will be wearing this lots this Winter. To make the look more interesting, I decided to wear this oversized tie sleeve sweater as a dress, with black tights and over-the-knee boots. 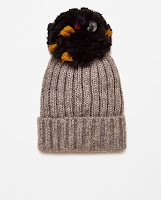 Also adding a beanie with a colourful pom pom which is gorgeous I think, and which I know for sure will be part of my Winter uniform ha ha . Love this look and love the snow. For makeup, I decided to wear a bright red colour to make my lips stand out. What do you think of this look, would you wear the sweater too? Let me know what you think and enjoy the rest of the week! Hola chicos! El invierno ya llegó (al menos eso parece hoy) con mucha nieve ! Eso me pone muy contenta ya que siento que Navidad ya está mucho más cerca y hoy fué el dia perfecto para ayudar a mi novio a poner las luces de Navidad en los árboles afuera y por supuesto, también fué la oportunidad perfecta para usar este jersey con las mangas súper anchas. Y qué mangas! Se que para algunas personas les parecerá un poco raro tener las mangas tan anchas, pero a mi me encanta y pienso que le da un toque más cool y original al típico sweater. También tengo que decir que este jersey es súper cómodo y de todas formas lo usaré mucho este invierno. 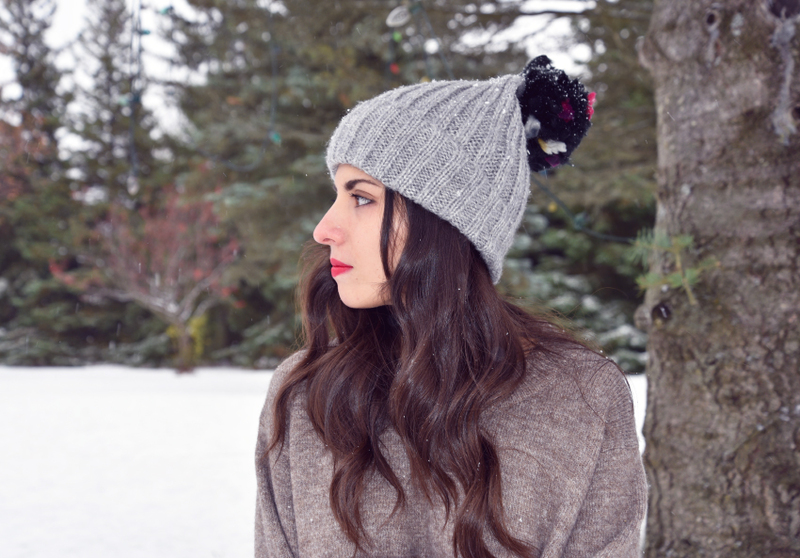 Para hacer el look más interesante, decidí usar el jersey como vestido, con medias negras y botas sobre la rodilla, agregándole también este gorrito plomo con un pom pom súper colorido que me enamoró, y que estoy segura lo usaré diariamente como parte de mi uniforme de invierno ja ja . Me encanta este look y me encanta la nieve. Para el maquillaje, decidí hacer un maquillaje natural con el toque de color rojo en los labios. 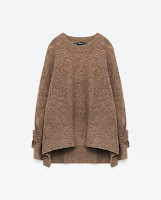 Qué piensan de este look, usarían también este sweater? Espero que les guste y que tengan una linda semana.